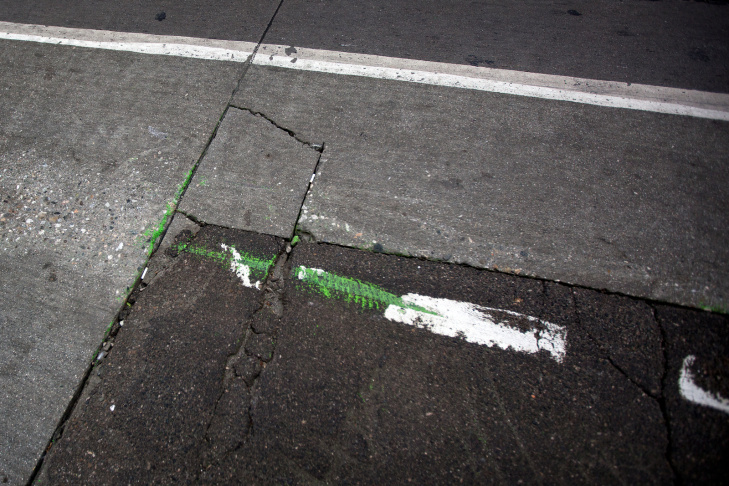 The original green bike lane had to be repainted multiple times because of chipping paint. The new design will be a basic bike lane with an outline of forest green paint. A rendering of what the repainted Spring Street bike lanes would look like. The architecture of Spring Street make it a popular location for film and TV production. The new bike lanes will be easier to cover up during shoots or in post production. Crews have begun chipping away at the green paint outlining bicycle lanes on Spring Street between Cesar Chavez and 9th Street. The original green lanes were part of the effort to increase ridership, but film productions found the color distracting and asked the city to change it. In addition to the green bike lane, Spring Street has seen many changes over the last few years, including new area murals and the addition of parklets. If you've driven on downtown L.A.'s Spring Street recently, it would be hard to miss the bright green bike lane. It was done as part of a pilot program to try and encourage more cyclists and improve public safety. But these lanes won't see their second birthday, said Eric Bruins of the L.A. County Bicycle Coalition (LACBC), a group that worked with the city to develop the lane. The city is in the midst of scraping and repainting it to appease a coalition from the film industry who say the distinctly colored lane is ruining their film shoots. 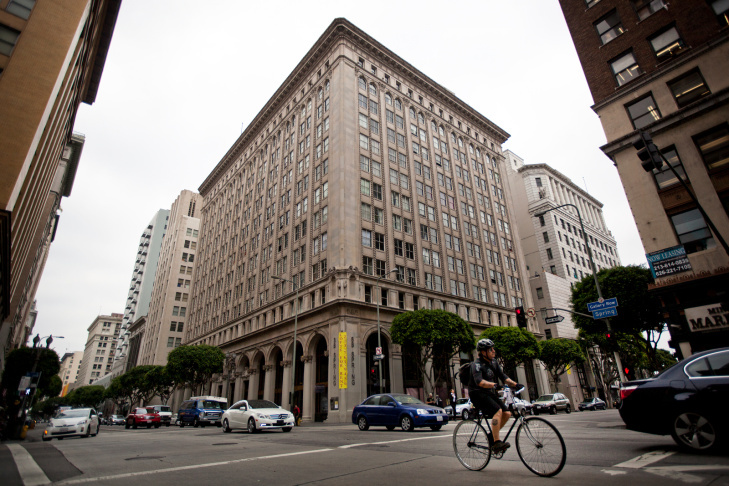 Ed Duffy, a business agent at the Teamsters local 399, said Spring Street is one of the most photographed streets in downtown L.A. — especially the blocks between 2nd and 9th streets. RELATED: Which intersections are the most dangerous in Los Angeles? "We use those areas for period shows, for different cities across the country and around the world and the bright neon green bike lane became problematic almost immediately when they put it down, simply because it stands out so much," said Duffy. He said the modern, distinct lane makes the street less flexible as a backdrop for different decades and locations. Duffy said some projects, like "Mad Men," had to avoid the area altogether, while others stuck solely with interior shots. Although these re-locations may seem minor, he said that every shoot counts when Hollywood is trying to keep production in Los Angeles. 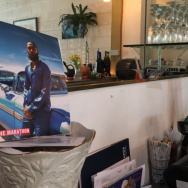 But downtown isn't just a film set, it's an evolving neighborhood. 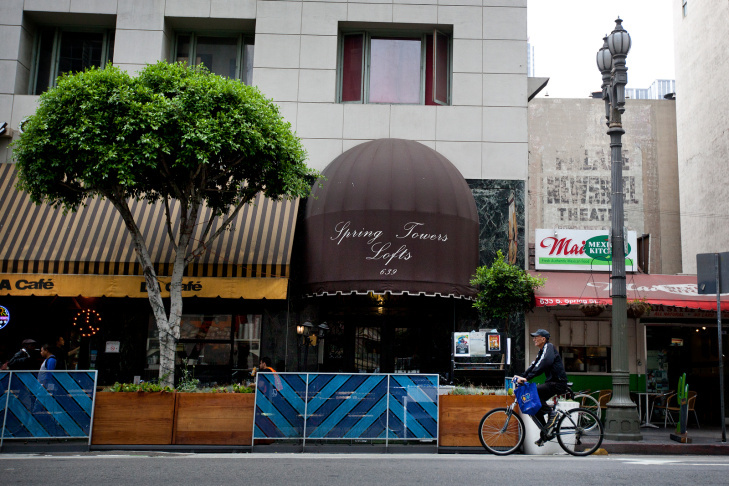 Bruins said that Spring Street is "trying to express itself with some character and uniqueness" by encouraging projects like murals, parklets and the green bike lane. But the film industry is "a force for the status quo," because a changing Spring Street means it looks less like "Anytown U.S.A."
"Those are the two forces that kind of collided over this thing," Bruins said. And as soon as the green paint hit the pavement less than two years ago, the film industry began to protest. In June of this year, the L.A. City Council approved a new lane design intended to be a compromise between Hollywood and cyclists. The bike lane will be repainted forest green, with sections like bus stops and turns distinguished by wide stripes of the same paint. Although the impact of this change is not yet known, Bruins said the original design yielded real results. Since the green lane was installed in 2011, the number of cyclists using the route has doubled and female ridership has quadrupled, according to the LACBC. "Women tend to be a little more risk averse and so if we see more women riding on a street, it means that we're doing something right in terms of making that street feel safe to ride on," Bruins said. The new, muted design is meant to be a compromise between the film industry and bike advocates, but neither side is entirely happy with the result. Duffy said that although the colored outline will be easier to cover up than a solid painted lane, it will still provide hurdles to filming. And Bruins said that although the lane will still be "accented with color," the pilot program was shut down before agencies had a chance to see the full results. 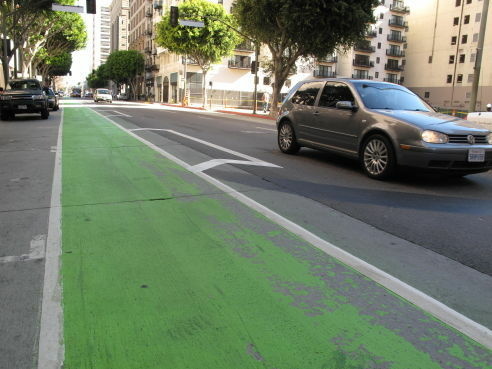 The original green lanes were not without issue either; the paint peeled and chipped and required additional testing by the Los Angeles Department of Transportation. The Spring Street lane also required multiple touch-ups, including just one week after its debut when cars drove on the lane before the paint had dried completely. The darker colored lanes should be completed in time for the October 6 CicLAvia.